Either she and her children would emerge from that wilderness together, or none of them would… In 1774, the Ohio-Kentucky frontier pulses with rising tension and brutal conflicts as Colonists push westward and encroach upon Native American territories. The young Inglesby family is making the perilous journey west when an accident sends Philip back to Redstone Fort for help, forcing him to leave his pregnant wife Clare and their four-year old son Jacob on a remote mountain trail. When Philip does not return and Jacob disappears from the wagon under the cover of darkness, Clare awakens the next morning to find herself utterly alone, in labor and wondering how she can to recover her son...especially when her second child is moments away from being born. Clare will face the greatest fight of her life, as she struggles to reclaim her son from the Shawnee Indians now holding him captive. But with the battle lines sharply drawn, Jacob’s life might not be the only one at stake. When frontiersman Jeremiah Ring comes to her aid, can the stranger convince Clare that recovering her son will require the very thing her anguished heart is unwilling to do—be still, wait and let God fight this battle for them? 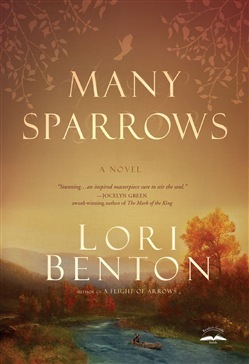 Acquista Many Sparrows in Epub: dopo aver letto l’ebook Many Sparrows di Lori Benton ti invitiamo a lasciarci una Recensione qui sotto: sarà utile agli utenti che non abbiano ancora letto questo libro e che vogliano avere delle opinioni altrui. L’opinione su di un libro è molto soggettiva e per questo leggere eventuali recensioni negative non ci dovrà frenare dall’acquisto, anzi dovrà spingerci ad acquistare il libro in fretta per poter dire la nostra ed eventualmente smentire quanto commentato da altri, contribuendo ad arricchire più possibile i commenti e dare sempre più spunti di confronto al pubblico online.